I was able to get a stool sample from Gandalf on Sunday and brought it into the shelter to have them look at it. Unfortunately their head tech had gone home sick and the staff members who were working weren't as comfortable with their diagnostic skills and identification of parasites, however she did immediately say lungworm without knowing that he was suspected of having it, so I'm going to take that as confirmation of it. I am fairly certain we have had some progress in his health. Generally giving him liquid medication has been trying because he had a difficult time deciding if he should be swallowing or breathing. The last two doses went in slightly easier. He also seems to be able to eat a bit more before having to take a break. I am cautiously optimistic. Gandalf, however, cares not for my opinions on the matter, he simply wants to play. The costumed photo was photoshopped from four different photos. I put each one in their outfit (well not Ethan Errol as he was opposed to clothing) and took about 100 photos until the right look was achieved. Since they were all taken on the same backdrop and generally at the same time of day we didn't have much more to do but crop and paste... well, there was a bit more to it.. I know I featured Jack on last year's card too.. but he's just so darn handsome. I figured you wouldn't mind. Gandalf is a sick little boy. I took him into the shelter on Tuesday and the vet there said his lung sounded clear but his larynx looked inflamed. She wanted to sedate him to take a good look but she didn't have the time. Arrangements were made to take him to a local vet the next day for a once over since the shelter vet wouldn't have the resources to check him over the next day either. There he was given an x-ray and his lungs, which should be black, were all white. Since he only reliably eats raw food and they didn't have any to offer him, he hadn't eaten that night so he had no stool to offer them, so they guessed he has lungworm. They sent him home with two different antibiotics and Panacur a full spectrum dewormer. He produced his first stool on Christmas, so hopefully we'll have something to offer them today to test. I'm also afraid all of those antibiotics are going to kill the good bacteria in his gut and cause diarrhea, so I'm giving him some probiotics and a dash of vit c.
He doesn't seem any worse, but at this point we don't have any real improvement... it might just take some time. I just need to make sure he eats enough to sustain his life while we get everything else straightened out. He will be with me a minimum of two more weeks while he gets his course of medication and hopefully improves enough that at that point he can go on, but if it takes longer I'm okay with that too.. I mean seriously, with that face who wouldn't want him around? Hey, Lady.. this mouse.. it's stirring..
nope.. You so need to stop doing that..
Now you sit there nicely and stop that stirring. You're welcome. Now.. where is my stocking? I say this way too many times.. and yesterday I said it twice. When I got home from work I saw this..
Now I will admit that I was probably jumping to conclusions on this one, but this has her pawprints ALL over this.. Then I walked down the hallway and saw the jar of fish food in the hallway. Now again, maybe I'm jumping to conclusions on this one as well since I woke up this morning to Kit standing on the fish tank, but 99% of cat/fish interaction has been with Fleurp, so she is getting the blame on this one too, especially since I moved the cat tree this morning so it wasn't right next to the bureau and most of my cats are clever enough to get the hint and be 'good' for a couple of days.. Fleurp just takes these types of things as a challenge. This incident was a bit troubling since the nearly three pound glass jar that I kept on the bureau to keep Fleurp off of it had also fallen.. (I was storing the fish food in the jar hoping to prevent exactly what happened today because fish food smells exactly like fish flavored cat treats) and you can see the damage it did to the metal cover, it is a darn good thing it didn't hit her on the head. Looks like I am going to have to get a can of motion activated canned air to keep her off the tank. I honestly do not mind if The Crew sit there and watches the fish, or if they paw at the side of the tank, but I have never let them get on the bureau and I certainly do not want them sitting on top of the fish tank. cats.. they can be so frustrating. It is a good thing they are so darn cute doing it..
Twenty five years ago, on a very very foggy night.. (mom should have known to be a bit more specific when asking for it to be 'white out' for their wedding) a man and a woman walked down an isle. Five apartments, two homes, 11 cats, 2 rabbits, 409 fosters later, one of them is now posting photos of cats and an elf on the internet..
As you all remember I was very happy to have found homes for all of the kitties in the last litter before they were due to go up for adoption. It was a first for me. Even Lovey found herself a home. Well unfortunately that home was not her final destination. Lovey was a young girl and she had some issues here being cooped up and being 'surrounded' by other cats. I assumed that her few instances of putting on her floof suit were protective in nature and I did my best to prevent her seeing any members of The Crew. When Dee told me she wanted to adopt her, we decided it was best that I hold on to her for a week after her spay and separation from the kittens to see what her personality really dictated regarding other cats. I offered her bedding my cats had slept on quite a bit and she didn't care and promptly laid down on it and claimed it as hers and slept on it nearly exclusively for a few days. After some time had passed I left the door open a bit with the baby gate up and let her see my cats. She growled a bit, but when I told her to stop she did and turned around and asked for food. I took that as a very good sign that she would eventually adapt to having other kitties. As the week went by Lovey developed a case of cabin fever. She didn't much like it when I left her alone in that room. She was by no means problematic, but she would cry for me for a few minutes after I left. Because of this I probably pushed her adoption to happen sooner rather than later, but I honestly do not think that waiting another week would have made much of a difference. See when Lovey went to her new home, Dee did everything 'right'. She set up Lovey in one room and spent a lot of time with her, snuggling and playing with her. She did scent swapping - bringing in items her boys slept on etc. She left Lovey in that room for several days while she adapted to the new home and the idea of new roommates. The first introduction went badly. Lovey was NOT happy to share her new home and her new mom with two boycats. Cats were separated and it was hopped that more time and more acclimation to the boys would help. It did not. Lovey was not happy stuck in one room and started bolting through the door, and then would go into attack mode around the boys. Fortunately no one was hurt, but no one was happy. Could Dee have held out and forced this to work, possibly, but it would have taken a long long time and everyone would have been miserable while doing it and a stressed out cat is a cat that is prone to illness... and with Lovey's ability to bolt out of her safe room and force the situation - well it could have gotten bad. So it was decided that Lovey would be returned. It was not a decision made lightly or without a river of tears. Dee very much wanted this to work, but she wanted Lovey to have a home where she wouldn't be so stressed out. Dee sacrificed the kitty she always wanted so that she could have a home she needed, as an only cat, and be happy. Lovey went back to the shelter this past Sunday. 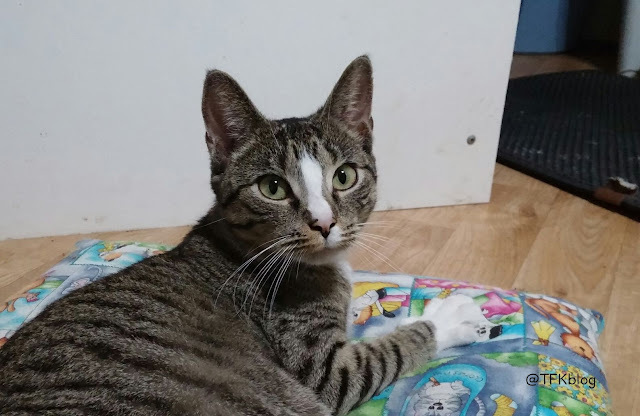 I met Dee there and we went through the paperwork and the questionnaire about Lovey's personality, and Dee brought Lovey's things, bowls, food, bedding, carrier, and a beautiful scratching post all to go home with her when she was adopted. Dee was also offered a credit for a future adoption, which she promptly reassigned to whomever decided to adopt Lovey. It was a tearful goodbye for all of us. Lovey went into her cage at the shelter very easily, and the shelter staff decided she was in good enough shape (not overly stressed from the car ride back) that she went up on the adoption floor. I spent a little time with her, but she was a little growly from all of the other cats there, and I thought it best to let her sit in her cage for a while and just get used to things. I had planned to stop by Monday to visit with her again. Well before Dee had made it home she received a phone call from the shelter letting her know that Lovey had been adopted. I will say I am impressed they did that because one of the stipulations of surrendering a cat is that you do not know what ends up happening to it.. At this point I know nothing about the adoption (because they didn't contact me) but I know it was all over her adoption card that she needed to be an only cat, so I'm sure she is lounging with her new people soaking in all the love she desires and being the total Diva she apparently was meant to be. Thank you Dee for wanting her, and I am so sorry it did not work out. While I am not a fan of rehoming a cat, I fully accept there are some legitimate reasons for doing so, especially when it is in the cat's best interest which in this case it was. We are now into the second week with Gandalf. I will say he is suffering from only kitten syndrome pretty fierce. He doesn't speak 'cat' very well so sometimes I'm confused as to what his intentions are, and he is far too bitey for a boy his age.. but fortunately he is learning and learning to bite softly. We are working on getting him to not bite at all, but I have a feeling he is just going to be that type of kitten - some just are. He has improved medically.. he is still congested sounding, especially when he plays, but he is now eating more than four bites. He is also slowly putting on weight. He feels like fur and bones right now, and hopefully the weight isn't a growth spurt because right now he needs to build a little fat and muscle. I am hoping that by the end of the week he'll be even better and maybe he'll need another week before he can move on. He is such a character that he has had three different inquiries after him, so it looks like he will go right into a home as opposed to into the shelter too. Gandalf is doing well enough. He is happy and active and plays with me and wrestles with me. He still sounds very congested though, and the worst part of it is that he isn't eating much at all. He gets very excited when I show up and does the dinner dance, and stands up and looks in the bowl as I am putting it down and then saddles right up to it and eats, but about four bites in he realizes it is too much work and gives up... or maybe he can't taste it because of the congestion.. So when a box of Muse cat food showed up on my door (I won a contest somewhere, but I don't remember where I entered one) I thought that this particular flavor of sardines might help break through the congestion / lack of smell and he would eat more. He did the dance of joy, then ate his required four bites and walked away. I had picked up a can of A/D at the shelter and so I popped that and gave him some of that too. He did the dance of joy, then ate his required four bites and walked away. I picked the bowl up and moved it. He did the dance of joy, then ate his required four bites and walked away. This was going to get old fast.. so I sat next to the bowl and called attention to it and he came over, checked it out, then ate his required four bites and walked away. Every time I called attention to the food he ate four bites..so I kept calling his attention to it. At one point I even crawled over to the bowl and hovered over it like I was eating.. he ate eight more bites.. *sigh* but that was the most he had eaten while I was in the room since I brought him home, so there was that..
Then I gave him some loving, because the experts say that petting a cat boosts his immune system. You can see how well that went. I hope he shakes this cold soon.. or that Elf is going to show up and start telling him about Santa..